The sun continuously ejects a stream of charged particles travelling at supersonic speeds from 300 to over 1000 km/s. When this “solar wind” plasma reaches Earth, it encounters an obstacle which is the Earth’s protective magnetic shield, creating a shockwave when the solar wind decelerates. Such shockwaves are found throughout the Universe around stars, supernova remnants, comets and planets. They are particularly important because they are efficient particle accelerators, and may be the origin of some of the most energetic particles in the Universe. The shockwave upstream of the Earth is known as the bow shock, named after the shape of waves breaking in front of the bow of a ship as it moves through water. This shockwave differs to others such as that formed around an aircraft breaking the sound barrier since collisions between particles do not transfer energy. Since the plasma density is very low, particle collisions are extremely rare and negligible. Such types of shocks are therefore called collisionless. The interaction between particles and electromagnetic fields transfers energy in the absence of collisions. Under certain conditions, the bow shock cannot redistribute the required amount of energy to maintain its structure and it becomes non-stationary, initiating a wave-breaking process. The mechanism which initiates non-stationarity of the Earth’s bow shock was unclear until now due to the lack of closely separated spacecraft providing measurements at the right time and place. “These key minutes of data have been years in the planning, and started with the proposal of a carefully planned close-separation campaign designed to place two of the four Cluster spacecraft less than seven kilometres apart. Thanks to this we were able to make this unique and important measurement” says lead author Andrew Dimmock of the Swedish Institute of Space Physics in Uppsala, Sweden. “This result advances our understanding of one of nature’s most efficient particle accelerators,” adds Dimmock. Launched in 2000, the European Space Agency’s Cluster mission is comprised of four spacecraft in orbit around Earth and was the first to probe the Earth’s magnetic environment in three dimensions. “The Cluster mission has been a cornerstone for space physics, and has led to many new discoveries related to the Earth’s bow shock,” says Dimmock. “In this case, the unprecedented ability to study its structure on scales of only a few kilometres means that for the first time we could resolve the key intricate spatial structures which are so important to dictating its large-scale behaviour”. The researchers found that although there are two physical descriptions of non-stationarity, one is valid for the conditions at the Earth’s bow shock. Such a description involves the presence of an electron scale structure embedded within a thin region of the shock that undergoes the most dramatic change, known as the ramp. “This result demonstrates the significance of the Cluster mission, and its ability to still deliver important and novel scientific results”, says ESA project scientist Philippe Escoubet. Co-author Michael Balikhin also adds that “such work was only possible due to the hard-working engineers, scientists and operation staff in conjunction with the active Cluster community”. It comes as no surprise that the Cluster science and operations team were recently honoured by the Royal Astronomical Society by a well-deserved group achievement award. 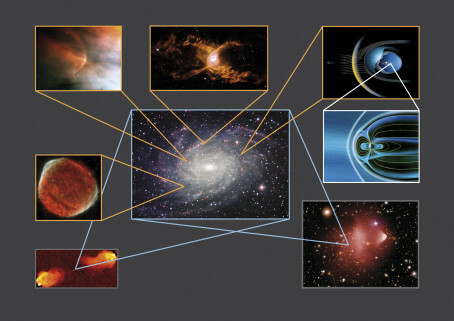 Shocks are abundant throughout the Universe, and this image shows multiple shocks which have been detected from numerous astronomical sources. Such shocks are formed when fast supersonic plasma suddenly encounters an obstacle such as a planetary magnetic field (such as at Earth), or a much slower flowing plasma. Copyright: NASA/ESA and The Hubble Heritage Team STScI/AURA (LL Ori); ESA & Garrelt Mellema, Leiden University, the Netherlands (Red Spider Nebula); CEA/DSM/DAPNIA/SAp and ESA/XMM-Newton (SN 1006); ESA & Lotfi Ben Jaffel, Institut d’Astrophysique de Paris-CNRS-INSU, Martin Kornmesser & Lars Lindberg Christensen (Solar System); ESA/AOES Medialab (Earth’s bow shock); ESO (NGC 6744); NRAO/AUI (Cygnus A); NASA/CXC/CfA/M.Markevitch et al. (Bullet Cluster).